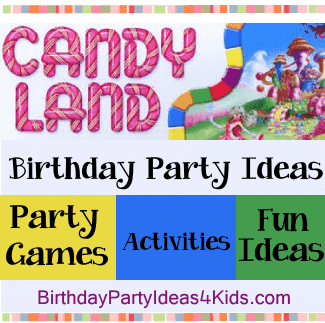 Fun Candy Land birthday party theme ideas for kids parties. The Candyland birthday party theme is great for boys and girls and children of all ages. Make a great 1st birthday party theme too! Have a birthday prize walk instead of a cakewalk. Place construction paper with numbers written on the front on the ground in a circle or oval out of the colors on the candy land game board. Start the music and the birthday party kids walk around the circle until the music stops. Pick a number out of a hat or roll a dice to decide which number wins a prize. The child that is standing on the number that is picked gets to choose a small toy from the birthday games prize table. In a large clear plastic jar with a tight lid place lots of different types of candies … skittles are a good colorful choice. Count the candies as you are placing them in the jar. When guests start to arrive ask them to guess how many candies are in the jar. Write down their name and their guess. The person closest to the number in the jar wins the jar! For more fun birthday party games birthday party games page. Use solid color colorful invitations in bright colors. Copy the game board to the invitation or make your own by gluing small squares of construction paper or square stickers on the card. Use extra playing cards from the game or make larger versions and include different colors in the invitations. Ask guests to dress in that color for the Candyland party. Attach party information to a candy cane (Candy Cane Forest) or a small bag of gumdrops (Gumdrop Mountain). Tie colorful balloons to the mailbox so guests will know where the party is at. Then use colorful pieces of construction paper laid side by side (in the colors of the game board) leading up to the front door. Outside make a lollypop trail with larger then life lollypops (Styrofoam discs covered in saran wrap with a dowel for a stick). Hang lollypops and big candies from the trees. Or make large candy cane signs that say "This way to the party!" Inside: Continue the game board trail with the construction paper sheets. Have the trail lead from one room to another where you will be playing different games. If you will be playing in one room, lay out a large game board on the floor with the paper. Make signs and name the different stations from the game. Use colorful helium balloons tied to the backs of the chairs at the cake table. On the table place a white tablecloth and scatter fun candies, gumdrops and striped lollypops on the table. Buy several different colors of plates and cups and mix and match for table settings. If you can find an after Christmas sale stock up on large candy canes and use them to decorate. Buy hats the colors of the game pieces … or use colored t-shirts and turn the guests into their own game piece. Place squares of construction paper on the floor in the shape of the game board trail. 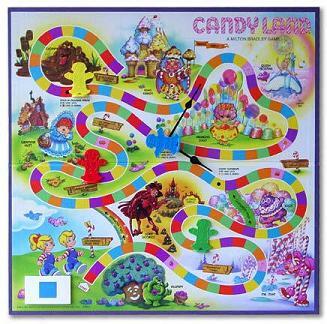 Use the color cards from the game and let the children play a life size version of candy land. Let kids make their own lollypops, then wrap them up for a party favor to take home. String colorful beads and make necklaces and bracelets. Let children decorate their own cupcakes. Set out lots of sprinkles, gumdrops, candies and frosting for them to choose from. Let children decorate their own cookies shaped like gingerbread men - just like the game pieces! Make a sheet cake and frost with vanilla frosting. Then use square pieces of fruit roll ups to create the game board on the cake. Decorate with peppermint sticks, gumdrops, etc. Set up a candy table with jars full of different types of candies. Put small scoops in each jar. Give the party guests small sacks and let them fill them up with the different candies. Large candy bars with your child’s picture and “Thank you for coming” on a large address label. Small boxes of Junior Mints or Candy Canes. Let children decorate white sacks when they arrive and are waiting for the party to start. They can use them to hold their piñata candy or other prizes. What did we miss? Help us add to the Candy Land Party Theme with your ideas - share your ideas.